To own any kind of pet you need a sense of humour. The saying “Cats don’t have owners, they have staff” really sums up looking after other people’s pets. There are so many different types of puss. We have cared for feral, stray, rescue and pedigrees. Some are content, others bold and bordering on aggressive; some can be very needy demanding lots of attention and toys, some are playful and great fun. Most are fairly quiet but some are very noisy, particularly the Bengals and Siamese who have a lot to say! Some can be very timid and stressed. All ages come in to stay with us, the youngest so far was 3 months and the oldest was 25 years! Some of the elderly pets are very frail and can be blind or deaf and special care is taken not to frighten them with sudden movements. Bella our youngest ever at just three months. Her owner needed an operation so in she came. Very cute! We are aware that as owners your pets are very important to you and parting with them, often for the first time, is a big concern. We hope to allay your fears by meeting with you before you board your cat with us. We take detailed notes on registration about your cat's food choices and any medications or special grooming. 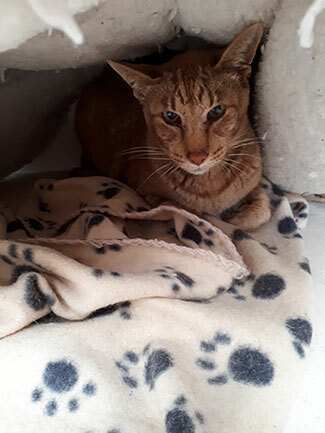 We encourage you to bring Puss’s favourite bed or blanket and anything that will help them settle. We always allow you to bring your pet into their allocated p en to get them settled and say goodbye when you are ready. We use two types of calming sprays. Feliway is plugged into the nearest plug to the most nervous puss and w e have the spray to lightly mist the pens. We also use Pet Remedy, a spray containing essence of valerian. We have catnip to put into bowls as well as catnip toys which also calms needy cats. Paulo a brown oriental, brings a large basket – he sleeps under it! The shadow is the basket on top. 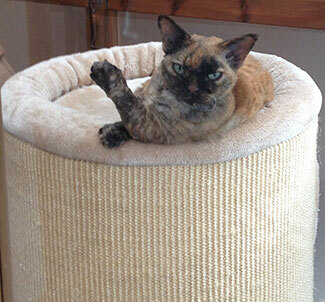 Devonshire Rex, Georgiana, brings her three story tower. She’s a tiny lady with three legs so needs help gambling about the pen. She’s giving us the royal wave. To help especially nervous cats we allocate pens near the kitchen so they can hide away and not be disturbed by the busy comings and goings. These pens are used for those on medications or frail and elderly. 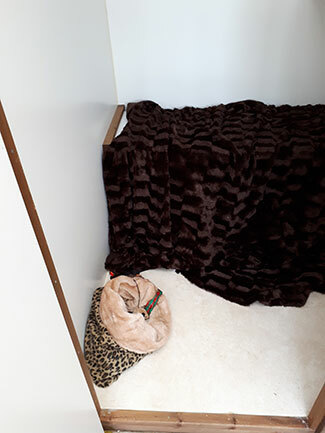 Another ploy used is to tuck a blanket into the first floor shelf to shield the sleeping basket. This is brilliant for helping new pussycats to settle and often once allowed to get used to the new environment Puss will come out to be fussed knowing they can hide away again. It should go without saying that they all get a huge amount of fuss, cuddles, strokes and play with toys but on their terms, not ours. Birdie and Ping came in with a host of stuff. Behind this mink stole is their sleeping basket which allowed them to hide but they soon came out. Twice daily boarding notes are very helpful when looking back over a cat’s stay. 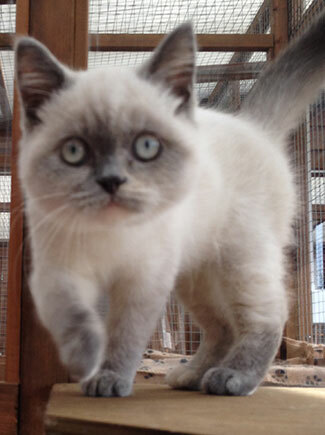 Most cats will be unsettled due to the journey, new environment and new smells as generally they don’t like change. Many will not eat for 24 hours. We are here to ensure the wellbeing and happiness of your pet. If they don’t eat I will offer anything to ensure we get them eating again. Usually when they are on special diets they start eating bits after a day of settling. Some cats are very thirsty and bowls have to be refilled during the day. In hot weather if a cat is not drinking we will administer water through a syringe given orally to ensure proper hydration, especially vital for those on a dried food diet. Often cats are on medication. We can administer pills orally with a pill pusher, often necessary with slow release medication for hypothyroidism. Others have twice daily pills pushed into their food. Often cats lose their appetites for the first couple of days so giving a small portion of food and making sure the pills are eaten is important to monitor. We have a Burmese, Benedict on twice daily inhalers:Lulu who has twice daily insulin injections and who comes complete with his (yes he’s a boy) own electric drinking fountain and a Siamese, “nobleman” Nigel, with elderly sore joints who brings his own heated blanket for his basket and he loves it even in hot weather!